The Internet is like a child’s game of telephone—facts become garbled, errors perpetuate, and misinformation reigns. One recent case involves German biologist and fashion designer Anke Damaske (not “Ande,” as TreeHugger reported), who spins milk into fabric. By the time the news petered down to the Huffington Post, the meme drew not awe but outrage. “Wait a second: haven’t milk fibers been around since the 1930s?” asks writer Joe Satran. “Isn’t milk-based fabric already integrated into many everyday products? Hasn’t the eco-friendliness of milk fabric been called into question?” The problem is, Damaske never called dibs on inventing the fabric. And that’s not the half of it. First, a brief history lesson. Milk fiber, sometimes marketed as Milkofil, Aralac, Merinova, or Lanatil, was invented in Italy and the United States in the 1930s, in part, to stretch the wartime supply of wool and cotton. Made from casein, an odorless protein found in mammalian milk, the fiber is said to have the consistency of silk but with naturally antibacterial properties (the latter is to be determined by actual science). Made from casein, an odorless protein found in mammalian milk, the fiber is said to have the consistency of silk. Damaske believes the textile combines the advantages of both natural and industrial fibers. In fact, she’s in the process of applying for Global Organic Textile Standard (GOTS) certification, the same international standard she holds her suppliers to. There are, of course, downsides to using milk for clothing. Traditional cattle farming accounts for 18 percent of the planet’s greenhouse-gas emissions, according to the UN Food and Agriculture Organization, more than all the world’s cars, boats, trains, and planes combined. But Damaske’s process doesn’t waste milk—quite the opposite, in fact. She uses only “secondary milk” that doesn’t meet grocery requirements and is thrown away. For turning food waste into fabric, Domaske should get due credit. And that’s the truth. I'd like to know how to make the milk fiber. This is the coolest thing I've ever seen! The Internet is like a child's game of telephone�facts become garbled, errors perpetuate, and misinformation reigns. 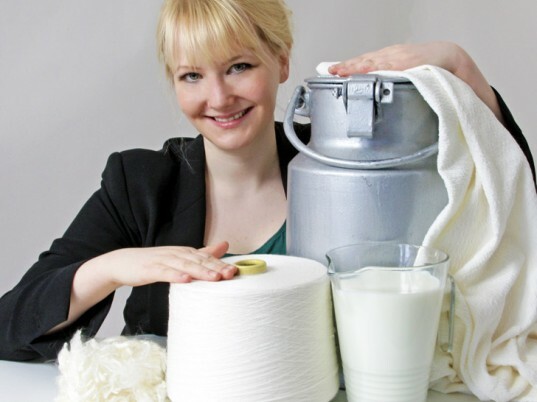 One recent case involves German biologist and fashion designer Anke Damaske (not "Ande," as TreeHugger reported), who spins milk into fabric. By the time the news petered down to the Huffington Post, the meme drew not awe but outrage. "Wait a second: haven't milk fibers been around since the 1930s?" asks writer Joe Satran. "Isn't milk-based fabric already integrated into many everyday products? Hasn't the eco-friendliness of milk fabric been called into question?" The problem is, Damaske never called dibs on inventing the fabric. And that's not the half of it.